Final interpretative sign unveiled for Revelstoke-Sicamous road camp. Stephanie Wiebe of CTV; Ryan Ellan; Laura Saimoto; Linda Kawamoto-Reid; Stony Nakano; Dana Oikawa; Howard Shimokura; Yosh Hashimoto in front of the signage near Revelstoke on Sept. 28. Photos credit: Howard Shimokura. 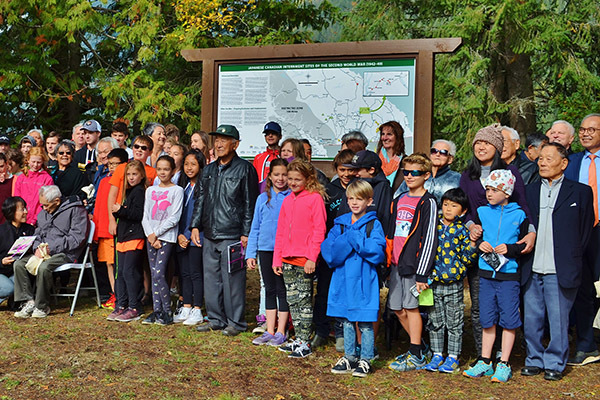 REVELSTOKE — It was a sun-blessed, crisp autumn day, with a brisk wind rustling the crimson leaves, when we unveiled the eighth and last interpretative sign for the Revelstoke-Sicamous road camp near Revelstoke (Three Valley Gap pull-out) on Highway 1. It seemed like the heavens opened up, since the day before was dark and rainy. Chief Wayne Christian from the Shuswap Nation called in our ancestral spirits with sacred drumming, and over 100 local residents and a busload of students from Begbie View Elementary and Revelstoke Secondary School made history with us. 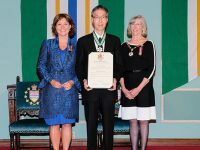 We heard heartfelt messages from Minister of State for Trade, George Chow, who flew in from Victoria; Masayo Tada, Acting Consul General of Japan, who drove seven hours from Vancouver that morning; Greg Kyllo, MLA for Shuswap; Gary Sultz, Revelstoke Councillor; Cathy English, Revelstoke Museum Curator; and Terry Sinton, Sicamous Museum. We were especially honoured and blessed to have two road camp survivors attend the ceremony. Our guest speaker, Stony Nakano, 97, was a road camp worker at Griffin Lake. He flew in from Toronto, accompanied by his nephew, Dana Oikawa. 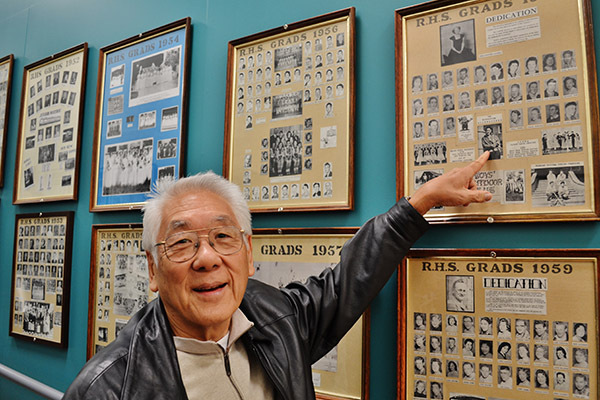 Tam Nakagawa, 100, also made great efforts to make the trip from Salmon Arm, B.C. He was formerly at Yard Creek road camp. Two minivans drove up from Vancouver and those from Vernon, Calgary, Edmonton, and Salmon Arm drove along Highway 1 to attend this historic event in Revelstoke, a railway town and gateway to the Rockies and Alberta. We have now come full circle from just under a year ago when Honourable Claire Trevena, Minister of Transportation and Infrastructure, committed to the Highway Legacy Sign Project to mark the actual sites of internment and road camps with interpretative signs. 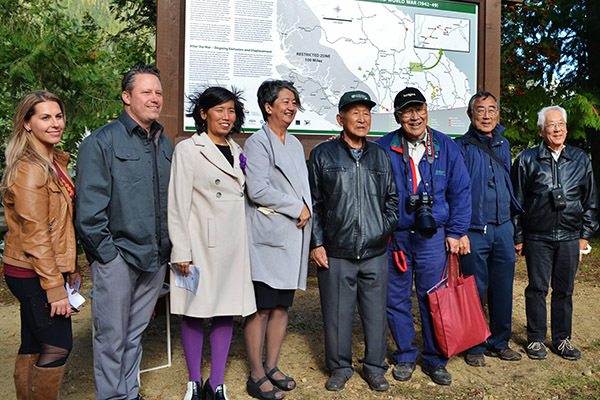 Since Oct. 27, 2017, when Minister Trevena unveiled the first sign at Tashme internment site in Sunshine Valley, outside Hope, we have unveiled eight interpretative signs and three Stop-of-Interest signs. What a year! The Revelstoke-Sicamous road camp sign specifically commemorates those Japanese Canadian men who were separated from their families and forced to build Highway 1 from Sicamous to Revelstoke. There were six camps in total. 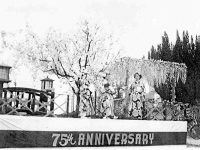 Able-bodied Japanese Canadian men were sent to road camps, starting in March 1942. It was a historic opportunity to honour the past and to also acknowledge and thank workers of the present. We often take for granted those who built our great highways and who maintains them for us to get around our beautiful province. 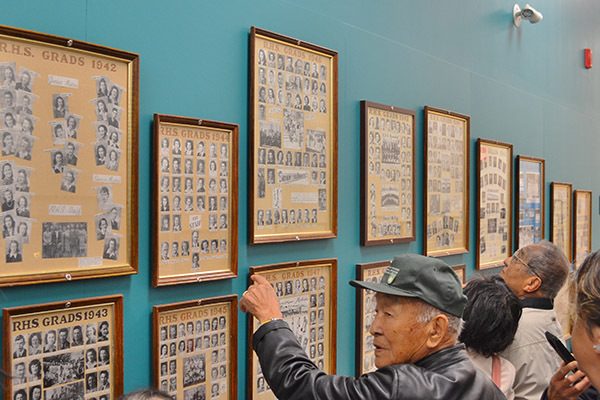 I would like to take this opportunity to thank our dedicated core committee members who gave, and gave of themselves to complete this project and execute the community fundraising campaign and unveiling events; Sherri Kajiwara, Linda Kawamoto-Reid, Lisa Uyeda, Karah Goshinmon (Nikkei National Museum); Howard Shimokura, Ryan Ellan, Jean Kamimura (Sunshine Valley Tashme Museum and Historical Society); David Iwaasa (TG); and the Lillooet Seniors’ Committee led by Dr. Aki Horii; Chuck Tasaka (Nikkei Legacy Park Greenwood); Tomo Fujimura (Revelstoke). We also thank our partners in crime in all of the local communities where the signs were installed. It was in large part due to the collaborative partnership with the local communities that got us lift-off and energized the local residents and schools to be involved. Thank you to the donors of our fundraising campaign and all those who supported the project. Lastly, we owe a debt of gratitude to Minister Trevena who believed in our project, and her leadership team at MOTI, led by Sandra Toth Nacey, and Devon Phillips who made it all happen, and the Heritage Branch. 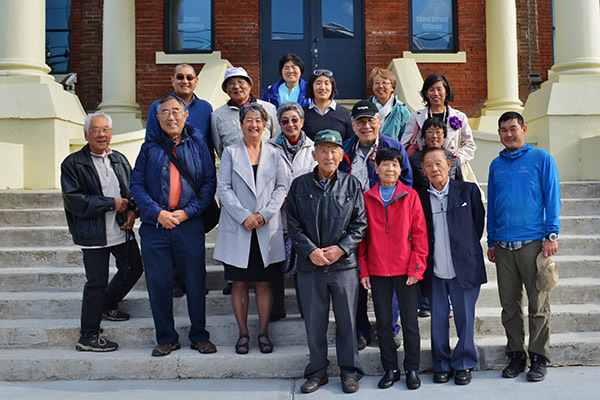 Our committee’s goal was education, to have permanent markers of our history where history actually happened, and to have local communities and local schoolchildren embrace Japanese Canadian history as their own history. We have created a lasting legacy that will continue to educate and teach the lessons of our history. It was also a great education for me personally, I thought I knew history, but now I feel it deep within myself. It has given me a deep appreciation for what it means to be Canadian. We did it—thank you all. It took a long time to reach its end but it was worth all the wait. I remember whenever I used to go out with my friends for a beer, we would place bets on when this project will finish.